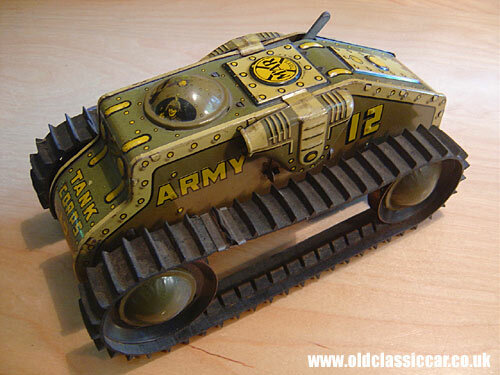 Clockwork tank by Marx Toys USA. 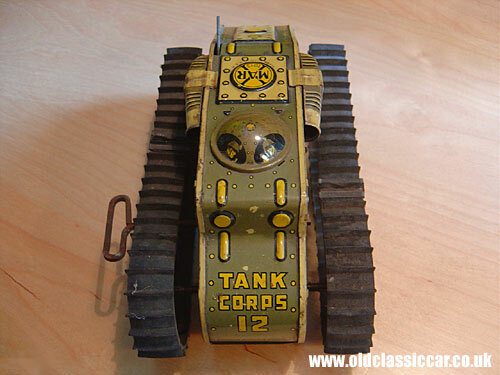 This hefty tinplate tank measures approximately 9.5" in length, and was produced by the American toy company Marx, I guess in the 1950s or 1960s. It features rubber tracks (often missing on these tin toys) and a large key on the side, to wind the clockwork mechanism. This example is in pretty good order overall, the motor works although there is something slightly awry with the drive inside. The lithography has survived quite well, especially for a toy army vehicle, as they often lead the hardest lives of all childrens' toys. or the Classic toys main page. Don't miss another classic Marx toy, this British-built tinplate racing car.